The Cook-a-Palooza Experience: Cucumber Ricotta Salsa - Doo-Whaaa...Crunch..Crunch! Cucumber Ricotta Salsa - Doo-Whaaa...Crunch..Crunch! Over the summer months I'll be consuming generous amounts of homemade salsa. I love experimenting with salsas because they can be prepared in a number of different ways. You have your traditional tomato-based salsa such as this Homemade Restaurant Style Salsa from Chelsea over at the Sprinkles of Parsley blog…perfect for nachos! Prefer tropical flavors? Try this Mango and Kiwi Salsa. Great on it's own or as a topping for grilled chicken or fish. 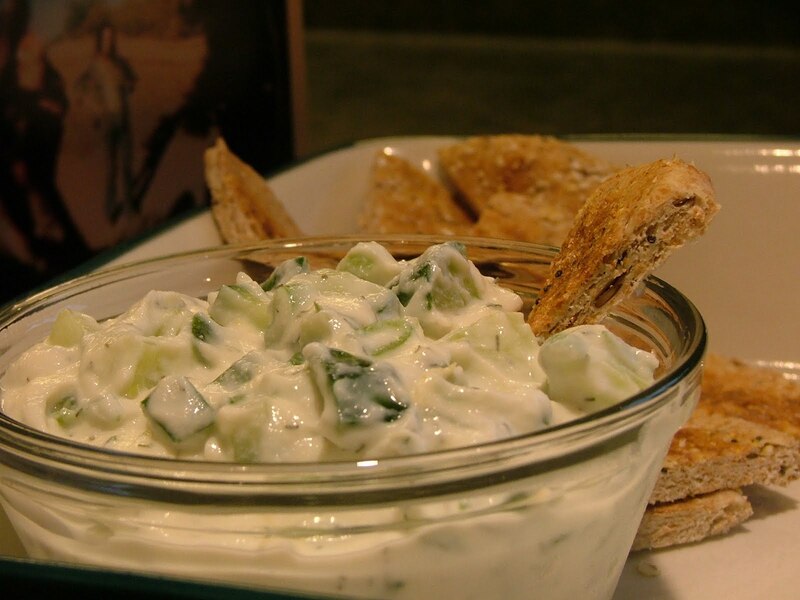 You can try a creamy based one such as this Cucumber Ricotta Salsa for dipping pita chips or Naan bread into. Another dipping option is taking half a whole grain bagel, rolling it flat with a rolling pin and then cutting it into triangles. This salsa may remind you of tzatziki suace but it's much lighter because you use light ricotta cheese instead of yogurt. The cucumber adds crunch and the fresh dill, green onions, lemon juice and mint bring out the flavors of summer. Whip up a batch and let the dipping begin! Hip Cooking Tip: If you don’t have fresh dill on hand you may be inclined to substitute dried dill. Don’t do it! The dried variety won’t work well here so make the trip to the store and pay the extra $2 for the fresh stuff. You will be rewarded for your effort. Song Pairing: This isn’t your typical salsa so I've paired it with Neil Young's song Wonderin' because it sounds like a '50s tune instead of the typical country-rock music Neil usually delivers. It's uniqueness it what makes it interesting and that's why I think it would pair nicely with this cooking experience. Plus it's such a catchy song! Don’t be surprised if you find yourself singing along while preparing this salsa. Can’t sing? No worries…Neil wasn't exactly blessed with a beautiful voice either. Have a sip of beer and let those "doo-whaa’s" rip! What’s your favorite summer salsa? 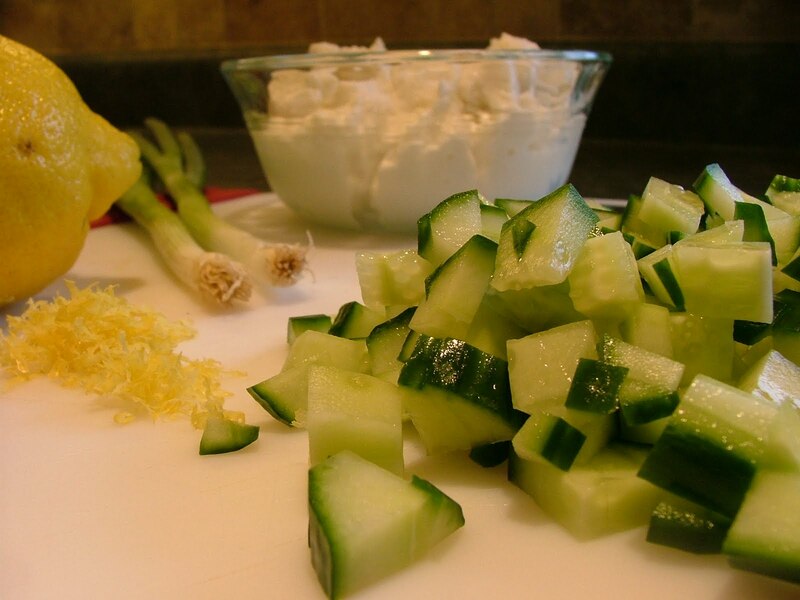 In a large bowl, combine cucumber, cheese, lemon zest and lemon juice. Stir in mint, dill, green onion, salt and pepper. Cover and let chill before serving.